Oakland School Board members voted to send notices to 538 teachers warning of potential layoffs, renewed four charter schools, and approved the second interim budget in a marathon eight-hour meeting Wednesday night. The teacher lay-off notices pulled the largest crowd and the most heated opinions. In order to comply with state law, the district has until March 15 to issue notices to teachers who are in danger of being laid off. Actual layoff notices will not be issued until May 15. 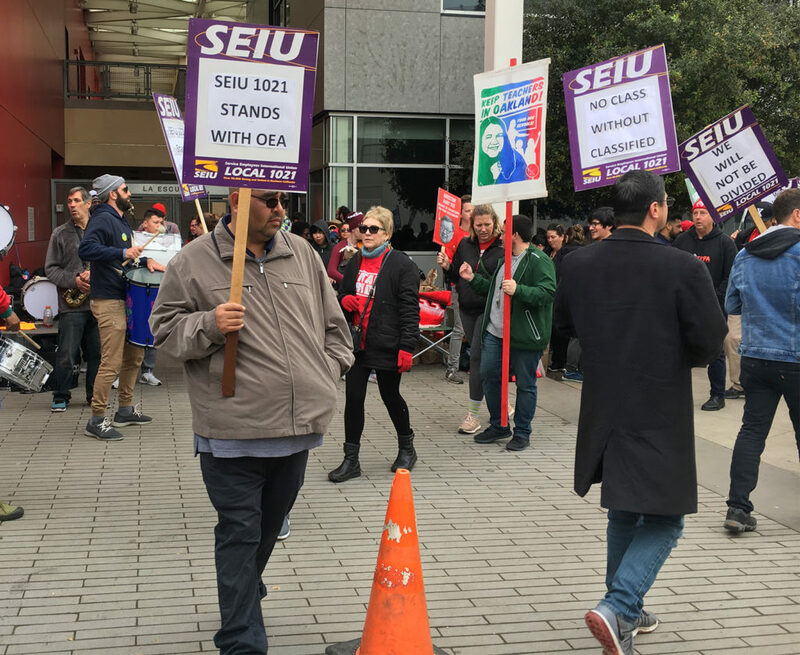 However, district officials likely won’t know if they have the money to avoid such layoffs until June, when they hope voters will approve Governor Jerry Brown’s proposed tax extension. Right now, no one is even sure the measure will be on the ballot. The state Legislature must approve putting the budget to a popular vote, something they were scheduled to decide this week. Amid speculation that this approval was unlikely, Brown announced yesterday that he would hold the measure back from consideration by the Legislature until an undetermined later date. Meanwhile, Oakland teachers are girding themselves for what would be the most extensive layoffs in years. The law requires that teachers with the least experience in the classroom be laid off first. And for some schools with a particularly young staff, this policy could gut current programs. “This will dismantle everything we’ve been there for,” said Anna Blake, a first grade teacher from Futures Elementary in East Oakland. Blake has been teaching for four years. “We recognize that everyone has to take cuts, but it’s unjust that we will take the most of these cuts in low-income communities,” she said. Blake cited her school’s huge gains on standardized tests over the last several years and her colleagues’ efforts to create after school opportunities for their students. A majority of teachers at Futures have five or fewer years of experience and they wrote to the president of the teachers’ union, Betty Olson-Jones, asking that their school not be disrupted quite so massively as it would be if nearly all its teachers were laid off. “I take really seriously their concern,” Olson-Jones said. But she was not willing to consider changing the union’s stance on seniority. “In the interest of our students we stand with senior teachers in supporting the seniority rule,” she said. Some board members disagreed. Gary Yee and Noel Gallo stated outright that they didn’t think seniority was the best measure for teacher effectiveness. Yee, who taught for 10 years in Oakland, said his fifth year teaching was probably his strongest and that he “tapered off” from his fifth to his tenth. “So who’s to say where in a career path the best teaching is?” Yee asked. Yee, the board president from district 4, wanted to know why the union wasn’t out in the streets this fall when Measure L, which would have raised money for teacher salaries, was on the ballot. If they had been, he charged, the district might not be facing quite as many layoffs. The resolution to send the 538 notices eventually passed with a 6 to 1 vote. District officials emphasized that these are not layoff notices. They are just giving fair warning to teachers who may be laid off. If funding for those teachers is restored in June, officials said, they would quickly begin rehiring. Next up were two charter schools district staff were not prepared to recommend for renewal. Every five years, charter schools certified by the district must appeal to the board for a continuation of their charter—the document that lists their mission statement and goals. Schools must show they are meeting the terms laid out in their charter and that their students are performing at least as well or better than those in similar schools in the city. Some board members were particularly concerned that African American students at Civicorps scored so much lower than their white classmates. Nine out of 11 white students at the small school performed at or above “proficient” on state tests, but only 18 out of 66 African American students did that well. Still, the school’s overall performance was judged to be as good or better than other neighborhood options and board members voted four to three to approve a conditional, two-year renewal. Civicorps will have to show strong growth and progress towards closing the achievement gap in that time if they want another renewal. Oakland Aviation High School in East Oakland did not fare so well. Though the school offers unique training for aviation-related careers, the small school is one of the lowest performing schools in the city. 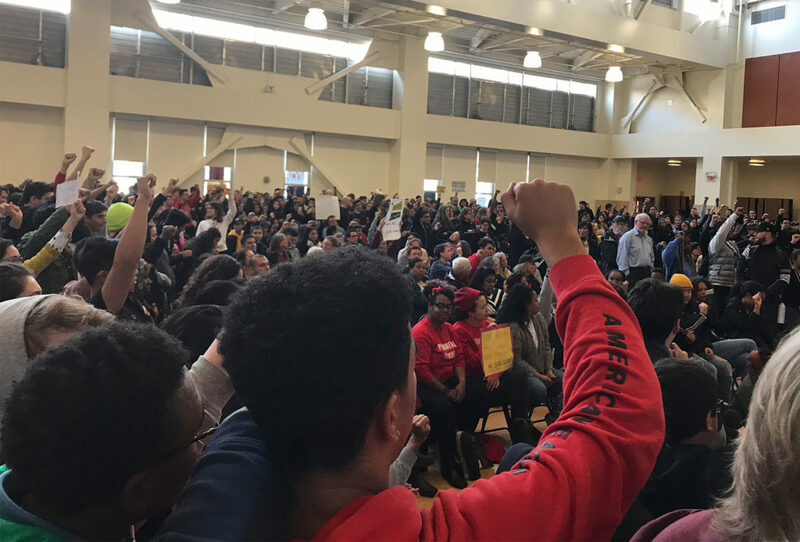 Both Castlemont and Fremont—East Oakland district schools with struggling academic reputations—are performing better, district officials said last night. But pleas from students, teachers and parents to keep the school open for another five years weren’t enough to sway board members. They voted to close the school in June. Students there will be placed in higher performing schools next fall. Three other East Oakland charter schools that recently applied for renewal—Achieve Academy, American Indian Public Charter and Lighthouse Academy—were swiftly approved. Finally, close to midnight, the school board heard a presentation on its second interim budget. Members questioned spending on some contractors and asked for more details on certain line items, but ultimately passed the budget. The district predicts a $19.7 million shortfall at the end of this school year because of late and deferred payments from the state. This article has been corrected to accurately reflect Anna Blake’s first name and four years of teaching experience. OaklandNorth.net regrets the error. Seven young teachers from Futures Elementary in East Oakland listened as board members debated the seniority rules that call for new teachers to be let-go first. Front row, left to right: Meredith Iserson, Katherine Thompson, Colleen DeBratto and Rose Lockwood-Holden; Back row, left to right: Anna Blake, Olivia Seiberth, Michelle Steers. It seems a school district that plans to layoff 538 teachers must have a serious problem that may not have nothing to do with the budget.